BBC News - How do you recycle a jumbo jet? How do you recycle a jumbo jet? It can take 12 weeks and a lot of elbow grease, but planes are recycled when they are too old or not needed anymore. How is it done? The silver shell of the 747, balanced on three piles of wooden pallets, shudders and wobbles alarmingly as its left wing slaps the ground like a wounded bird. All the while an excavator machine, equipped with a giant claw, tears into the tail of the once proud aeroplane, shredding its formerly protective skin into strips of scrap metal. After decades of safely transporting thousands of people to destinations around the globe, this is the fate that awaits aircraft when they are too old, or their owners cannot afford them any more. 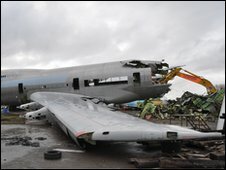 They come to an airfield in Gloucestershire to be scrapped. Plane parts are bought for any number of reasons. Anything from flying controls to doors and windows are bought by aviation companies for reuse, snapped up by production companies for film and TV and by the likes of the SAS for training. Seats are even bought by enthusiasts for their homes. Air Salvage International (ASI), based at Cotswold Airport in Kemble, is the largest specialist breaker in Britain and claims to be the busiest. Mark Gregory started ASI 15 years ago, after working as a mechanic for an aviation firm. Since then it has handled 350 aircraft. The company, which employs 25 staff, has been one of the few beneficiaries of the economic downturn. Last year it handled more planes than ever due to airlines going bankrupt or suffering huge losses. It dismantled 30 planes, usually it's more like 15 to 25. There are currently nine planes at the airfield waiting to be scrapped. 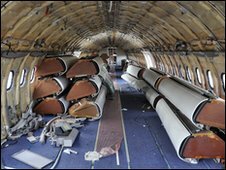 It costs a plane's owner between £60,000 to £120,000 to dismantle a 747, depending on what is required. The entire process can take up to 12 weeks. 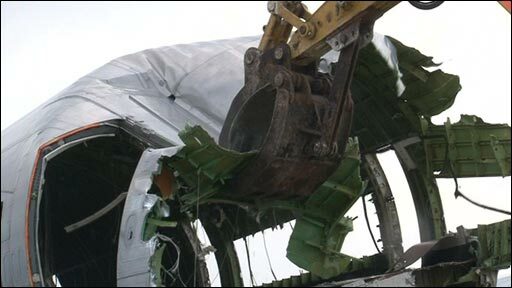 Up to 50% of an older jumbo jet can be recycled and on average they are taken out of service after 24 years. This can be for a number of reasons - wear and tear, costing too much to repair or maintain or simply being too old fashioned. The process can be categorised into three areas: engines, component parts and fuselage. This is how it's done. The core value of a plane is its engine, which can make up 80% of its total value. The rest of the plane can be sold for spares for about £234,000 ($350,000). The engines are the first thing to come off a plane after it arrives. They are tested and then can be fitted to another plane, stripped down further for parts or returned to the manufacturers to be repaired. You get more money for parts, rather than reselling the engine as whole, says Mr Gregory. Many planes are stripped of their engines and kept at Kemble until their owners, often leasing companies who loan planes to airlines, decide their fate. Some companies lease out engines under a scheme known in the industry as "power by the hour", which sees an airline pay for each hour a leased engine is used. The parts of a plane that can be taken off for reuse include items such as flight deck instruments, black box flight recorders, air conditioning, flying controls, landing gears (wheels and hydraulics), flaps and spoilers, fuel system and cabin interiors - like doors and windows. 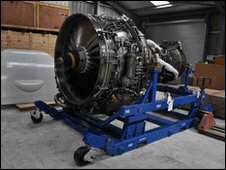 Parts must undergo stringent checks and be given a Certificate of Airworthiness before they can be reused on working aircraft. This can be done on-site by ASI or parts are returned to the original manufacturer by their owner for a complete overhaul. Every part, right down to the nuts and bolts, has accompanying paperwork that details everything about its history. These documents are kept for nine years after a plane is destroyed. Up to 50% of an older 747 can be recycled, whereas a newer Airbus A320 can have 95% of its parts reused. What can't be recycled is sent to a landfill site. The landing gear is the last thing to be taken off, leaving just the metal fuselage, which is propped up using piles of wide wooden pallets. It's then crunched up into metal fragments using an industrial wrecking machine, equipped with a giant claw. A 747 can take two days to be totally crunched. These are then taken off to specialist recyclers, who identify and handle them according to type - aluminium, copper or steel. A more modern Airbus can be broken up in just six hours, although the entire recycling process takes eight weeks. Apart from scrapping the metal, or saving parts for reuse on existing aircraft, what else can you do with an old plane? Plenty, according to Mr Gregory. A television production company has blown up a plane to film a demonstration of the consequence of foiled terror plots. Sections of aircraft have also been supplied for film sets. The Dutch Ministry of Defence has used facilities to test exactly how many explosives are needed to blow in the door on a 747, without injuring passengers. The SAS has used parts to work out how to gain access to aircraft by stealth, without blowing any holes but by using the existing structure of the plane. The police and armed forces have also come to shoot at seats to detect the behaviour of bullets in an aircraft environment. 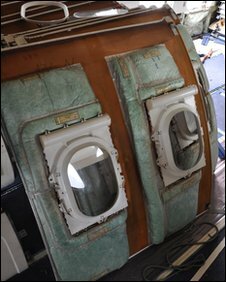 Doors from an Indian Airlines A320 are currently in storage at Kemble and destined for a training company in Spain, to allow stewardesses to practise removing them and throwing them out to allow an emergency escape. The rear section of another Airbus is to be sliced off and sold to British Airways, to allow its baggage handlers to practise loading luggage into the hold. Its top half is being cut away and sent to a training college, possibly for fire drills. One pilot even bought a complete flight deck of a veteran BAC 1-11 to install in his home as a bar, proving there's plenty of uses for a plane long after it stops taking to the skies. Not that any of the parts have made it into Mr Gregory's home. "I'm not a plane enthusiast, I prefer boats," he says. Another use, especially for avionics is the simulation industry. It is far cheaper for simulator manufacturers to use 'second hand' gear to build a flight simulator, than to use new off the shelf equipment. The Hawker 800XP simulator at FlightSafety International at Farnborough was once a wheels-up landing aircraft deemed beyond economic repair. I am pleased to hear Mr Gregory is providing good use after an aircraft is no longer in use. I am a plane enthusiast and have built simulation at home, currently using auto-pilot panel, yoke, throttle along with Ssiler and flaps, rudder and landing gear with trim (Boeing 767). I'd like to visit Cotswold Airport in Kemble to see the process and hopefully could add some parts to my simulation. The fuselages could be used for a fascinating range of uses such as bars, restaurants, temporary office space, adventure playgrounds even a home. I believe one was used as a temporary classroom a few years back. This subject would make a fascinating program for aviation enthusiasts combining the Kemble site with the storage sites in the US. Likewise the story behind old/unwanted trains/ships, I can see a technophobe series coming on here. A fascinating insight into the wonderful world of aviation. Mr Gregory is an inspiration to us all in this modern "throw away" society. I sincerely hope they look to make a program on this thereby spreading this wonderful story! Really, really interesting clip which I watched twice! I was wondering how planes were scrapped last time I flew and was reminded just how huge these vehicles are. Yes, I would like to see a full-length programme about this too and agree with Mr. Dutton that it could make part of a mini series covering recycling of trains, ships, etc. I am not an anorak but this is surely of interest not only to those who have travelled upon these vessels/vehicles but also to environmentalists. I'm amazed that only 50% of the older planes can be recycled. Admittedly current performance is better, but still the fact that half of a 180-tonne aircraft gets thrown away is quite appalling. Mr Gregory gets many plaudits for being "green", but please understand that he is a businessman first and foremost. As such his company makes money out of scrapage. The key point to the wider world is that if we want recycling schemes of ALL kinds to work they have to work ECONOMICALLY. Also, remember ABLE UK in Teeside? They got bad press for trying to scrap seven US Navy ships responsibly, because they were considered dangerous. Certain Green pressure groups tried to stop this, when the alternative was a beach in Goa using kids with hammers. About 10/12 years ago I dismantled Airbus aircraft at Chateauroux in France for European Aviation. They had the rotables overhauled/tested and sold off other bits for various uses, including the wings that went back to Airbus in Filton, Bristol for corrosion control analysis. I had a great time out there and it was very satisfying, 'recycling' didn't have as high a profile as it does now. I've seen the Kemble aircraft when passing and often wondered. I live very close to Kemble airfield and drive past it regularly. It's an incredible site seeing all these huge planes in various states of recycling. 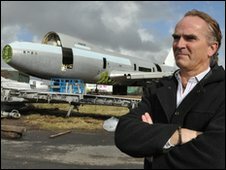 He should open his site as a tourist attraction, I for one would go and the kids would love watching planes being broken up. To Ian who is appalled at the fact that only 50% of planes are recycled. You have to remember that many/most of these planes will be 24 years old from a service perspective, and so will have been designed and constructed much earlier than when they first entered service. It's a shame they aren't more recyclable I agree, but attitudes to recycling and green issues 30 years ago were literally non-existent compared with now, not just in the aviation industry but everywhere.